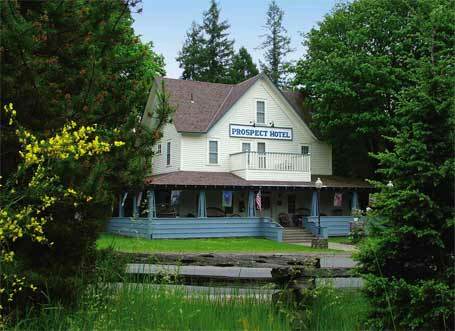 The Historic Prospect Hotel proudly offers cozy lodging just 28 miles from Crater Lake National Park and a stone's throw from the Rogue River. Built during the late 1880s, the hotel was once a stop for stage coaches, visited by the likes of Theodore Roosevelt, Jack London, Zane Grey and William Jennings Bryan. Besides the 10 guest rooms in the main house, 14 motel units (some including kitchenettes) and a wheelchair accessible room, the Prospect Hotel is home to a delicious restaurant, called by Sunset magazine "the best Dinner House between Medford and Crater Lake." The restaurant is open May through October as well as most holidays and by reservation for groups. While the Prospect Hotel is listed in the National Register of Historic Places, you'll find all the comforts of a modern inn, fit for romantic getaways, families and pets alike!